January this year the U.S. Government destroyed Megaupload, but founder Kim Dotcom is a not done with the file-hosting business yet and is preparing to come back with a vengeance. The coding work for the new Megaupload is nearly finished, the servers have been ordered, and investors are lining up. A return of the file-hosting site appears to be looming. With 50 million visitors per day at its peak, Megaupload was one of the largest websites on the Internet. This quickly changed January this year when the U.S. Government took down the file-hosting service and had several key employees arrested including founder Kim Dotcom. Abruptly, the focus of Megaupload’s team shifted from serving customers to defending itself in a high-profile criminal prosecution. While the criminal case is moving ahead very slowly, Megaupload’s founder does have some progress to report on another front. Dotcom previously announced that he planned to bring Megaupload back to life, and new information suggests that this may happen rather quickly. In an update this weekend he tweets that most of the work on the second incarnation of the site is already done. “Quick update on the new Mega: Code 90% done. Servers on the way. Lawyers, partners and investors are ready,” Dotcom teases. “Be patient it’s coming,” he adds. From the brief progress update it’s clear that the site is on schedule for launch later this year. In addition, it’s interesting to note that despite the ongoing criminal case, partners and investors are happy to be involved. In recent weeks Dotcom has delivered several hints about the new Megaupload, which he says will be bigger and better than the file-hosting service that was taken down. “We are building a massive global network. All non-US hosters will be able to connect servers & bandwidth,” he explained earlier. 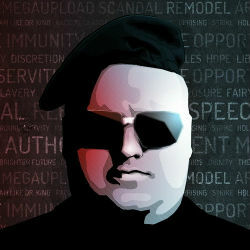 According to Dotcom we can expect a Megaupload with an even greater range of applications than just file-sharing. While developers of file managers are being encouraged to get in touch for early API access, Dotcom is also calling out to those involved in email and fax tools, VOIP and video apps. It’s clear that Dotcom doesn’t have the slightest urge to throw in the towel. It will be at least a few more weeks before the new Megaupload appears online, but there are exciting times ahead. MEGA exciting. c There are 223 comments. Add yours?